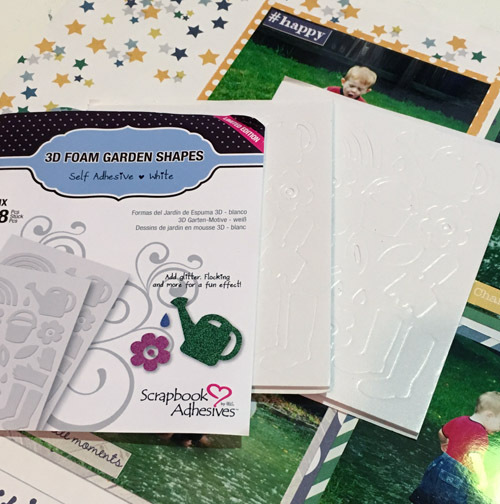 Have you seen all the different 3D Foam Shapes that Scrapbook Adhesives by 3L® offers? They have so many choices that can be added for a little something extra to your cards, layouts, and crafts. Today I used the raindrop designs from the 3D Foam Garden Shapes to add interest, dimension and a little sparkle to my layout. It’s perfect for my scrapbook layout, don’t you think? 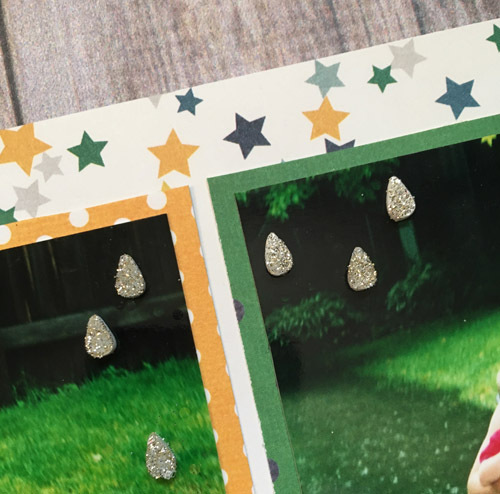 To stand out against, my green background on the pictures, I picked a fine silver glitter to embellish these raindrops. This package has a great variety of fun garden shapes in it from a watering can to butterflies to even a rainbow. I’ll be using some of those on a card I’m working on. Wear Your Adhesives on the Outside. 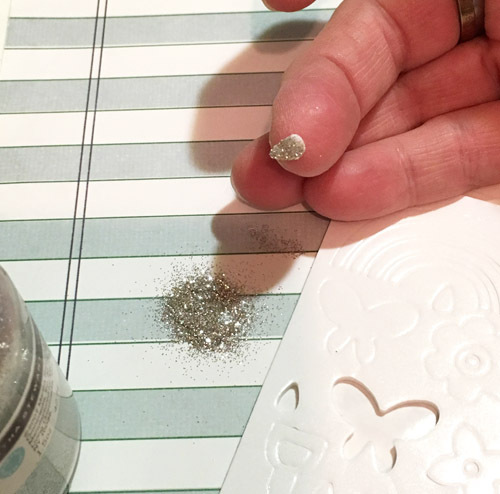 As you can see in the photo below, it’s easy to add glitter to these 3D Foam pieces. Since both sides are covered with adhesive, I removed the top liner and stuck it on my finger. Then take off the bottom liner and just tap it into the glitter. Knock off the excess and then adhere it to the scrapbook page. 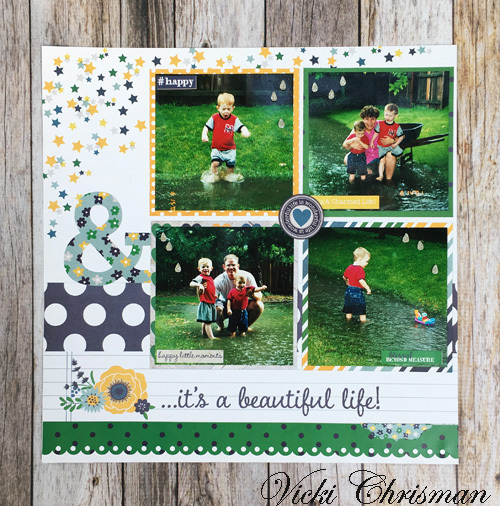 Don’t you love how these raindrops add interest and dimension to this layout? It goes well with the kids playing in the rain and I think they will think it’s really fun too! LOL! This entry was posted in 3D Foam Shapes, Adhesives, Crafts & Tutorials, E-Z Runner® Grand, Permanent Adhesive, Scrapbook Page, Scrapbooking, Seasonal Craft Ideas, Spring, Wear your Adhesive on the Outside and tagged 3D Foam Garden Shapes, E-Z Runner Grand Dispenser, E-Z Runner Grand Permanent Strips Refill, Glitter, Scrapbook Page, Simple Stories, Tutorial, Vicki Chrisman, Wear Your Adhesive on the Outside. Bookmark the permalink. One Response to "Embellishing with 3D Foam Shapes"